Crazy Star Wars Fan Theories That Will Fascinate You! 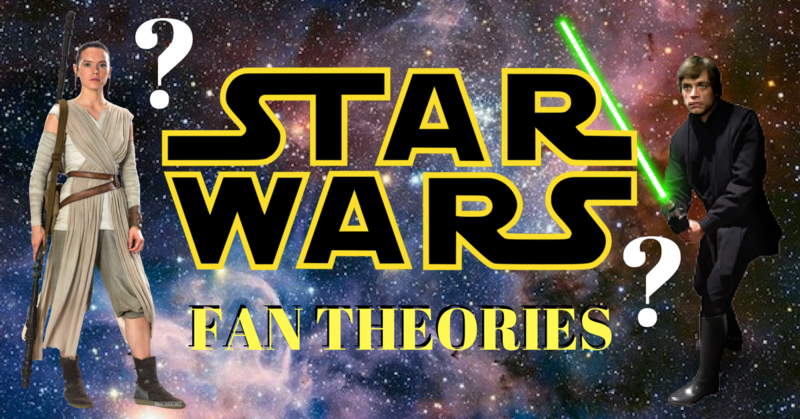 To celebrate today, we’re going to nerd-up and check out some Star Wars fan theories! And to make it lit, I’ve also added some dank Star Wars memes and gifs to entertain you and the rest of today. So let’s begin! So we already know some fan theories out there, fan theories that some of us have already made and guessed such as Kylo being secretly good (and not entirely an annoying little brat), and that Finn is force-sensitive. But there’s a couple of interesting (and ridiculous) fan theories out there that might tickle you or your fancy to know. And here’s a couple of them! (I might have gone full-on nerd mode here, and I do apologise). A. Luke Skywalker’s clone daughter…? This theory comes from a pretty famous Star Wars conspiracy theorist (which is a thing apparently) Mike Zeroh, who has probably been fascinated with Wolverine’s Logan a little too much. The idea is desperate to have Rey, in any way, be related to Luke Skywalker, but not directly because then, Leia would’ve sensed it during The Force Awakens. I have to admit, though it seems far-fetched, that cloning is nothing new in that universe. B. She had hatched from an egg. Talking about far-fetched, this seems like the most outrageous theory of them all. But according to some of Marvel’s Star Wars comics, publisher Poe Dameron’s title features a reclusive culture who worships a giant blue glowing egg that many believe will hatch the saviour of the galaxy, which some are assuming is Rey. And since many of the newer Star Wars film has been surrounding the ancient history of the Force (which we’ll talk about later), the egg theory seems to fit the theme. Though many are rooting for her to be a Skywalker, I’m personally rooting for this theory to be true. There’s also a very high possibility that she could be as some analysis of ‘The Force Awakens’ have noted that Rey’s apparel and style of combat – such as skulking around the Starkiller Base and such – seems to be just like Obi-Wan Kenobi’s. Granted there are some Jedi rules about Jedi celibacy but many have theorise that Obi-Wan might’ve been a little ‘naughty’ whilst in exile. If you don’t feel like nerding out on the video, Vendetta basically covers a few points and brings in evidence from the script and book that Rey might actually be a Palpatine, but what’s more evident is that Rey might very well be turning dark… which is a theory we will be covering later on. Note: Palpatine was a Sith, I highly doubt he’d follow the Jedi breeding laws, and may have just shagged through the entire galaxy for all we know. A. The Ancient Darth Plagueis. It has been hinted many times that Snoke is an ancient being (which is the theme for the newer Star Wars film), and the only evil and old character we’ve heard of (I mean it has to be someone we haven’t seen) is Darth Plagueis, who is the Emperor’s old, betrayed master. It might even support Vendetta’s theory that Rey might be a Palpatine since Snoke seems to know her. Even though director for The Last Jedi, Rian Johnson, has already shot this theory down, I still feel the need to have it on the list since directors love throwing us in different directions. B. Darth Vader is back! This is a theory that none of us want come to life. It would make the entire trilogy feel hopelessly circular and unoriginal. However, the scars on Snoke’s head do look very similar to Vader’s. But it can’t be. Anakin was seen in the newer version of episode 6, as a ghost, happily watching over his kids with Obi-Wan, so I highly doubt this theory will ever happen. C. Mace Windu rises from the grave. This is a far-fetched theory, but if Master Windu is back, he might have a bone to pick with the Skywalker family. Some speculate that he was never actually murdered by Anakin and that he was just badly disfigured. Many have also pointed out that Kylo Ren uses one of Windu’s lightsaber moves – the back spin and slice move – and that Snoke might’ve taught it to Ren. 3. Who’s the last jedi? This has to be one of the biggest and most fascinating theory out there after the title for the 8th Star Wars film was announced. The fan theory started out on Reddit by user AnakinKardashian and has exploded ever since. The user pointed out that it has been hinted several times in the new films that we’re supposed to get into the mind-set that the Jedi Order is very very ancient. In the most recent novels, Palpating had sent someone to Jakku to uncover an ancient secret, in The Force Awakens, Luke is looking for the original Jedi temple, that Snoke is really old and that Kylo Ren’s lightsaber has been confirmed to be an ancient version of the lightsaber. There’s a sudden obsession about the ancient Jedi history in recent Star Wars media, so AnakinKardashian posed an interesting question; what if the Jedi we know today are not really Jedi after all? Now, if this theory is true, it would be the most obvious one as everyone knows the scroll does not lie. Also, Snoke had called him that during a conversation with Kylo. So that’s that. Kylo is still technically a Skywalker and from Luke’s point of view, he’s also technically the last Jedi that Luke would have ever taught (of course until Rey came along). But since he murdered someone epic, he had completed his training as a Sith lord and is pretty much in the Dark Side right now. Who knows? He might do a 180 and turn good. But also, let’s talk about the fact that Jedi can be both plural and singular, and the Spanish and French titles also seem to hint that there’s more than one ‘last’ Jedi. So, it could be both Rey and Kylo, or who knows, the whole entire Knights of Ren or something. So right now, it’s obvious that Rey is good, and Kylo is bad, and I’m sure there’s going to be a lot of Rey & Kylo moments. But there’s a ton of theories that talks about the two and how both their characters are going to play out. The most fascinating (and probably happening, in my opinion) is that they’re going to swap sides. Snoke had already shown some interest in meeting her during The Force Awakens and Kylo seems like he reaaally dislikes her. Could it be jealousy? Also as we’ve seen from Anakin, having Force powers come too quickly and easily tends to be a dark side trait. She has also, in many moments, have battles with her inner anger and aggression, especially her showdown with Kylo Ren. And as Vincent Vendetta point out earlier (see point 1.d), the script and novel have stated multiple times that Rey’s evil side whispers to her every once in a while. Maybe there was a more sinister reason as to why she was left in a dessert planet. Imagine if some of Skywalker’s trainee Jedi actually survived the assault and a manipulated-Kylo might have led them to revolt against Luke. Maybe that’s why Luke’s face seems so haunted in The Force Awakens’ final scene. I love the idea of Rey being evil and a Kenobi. But what I’d love more is if Kylo turned good, and work together with Rey (like the old Skywalker and Kenobi days) to fight Snoke. But right now, the more curious thing is that we all know Finn is force-sensitive and I really would love to know how his force-sensitivity will play a part in this trilogy! Who knows? Maybe Kylo will turn good and work together with Finn to defeat an evil Rey. If that happens, YOU HEARD IT HERE FIRST! What do YOU think is going to happen in the new Star Wars trilogy?